SALT LAKE CITY, Utah – HARMAN’s DigiTech today announced the re-introduction of its DOD Compressor 280 guitar effects pedal bringing back the unmistakable smooth sustain and volume “squeeze” that only an electro-optical compressor can deliver. The Compressor 280 keeps all the distinctive sonic personality of the original while adding modern pedalboard-friendly features. “Whether you need to keep your guitar volume consistent when recording, are a country player who wants to avoid drastic volume changes when alternating between single notes and chords, or are an adventurous guitarist looking to add extreme compression to your rhythm and lead playing, the Compressor 280 can give you all these sounds and more,” Cram noted. 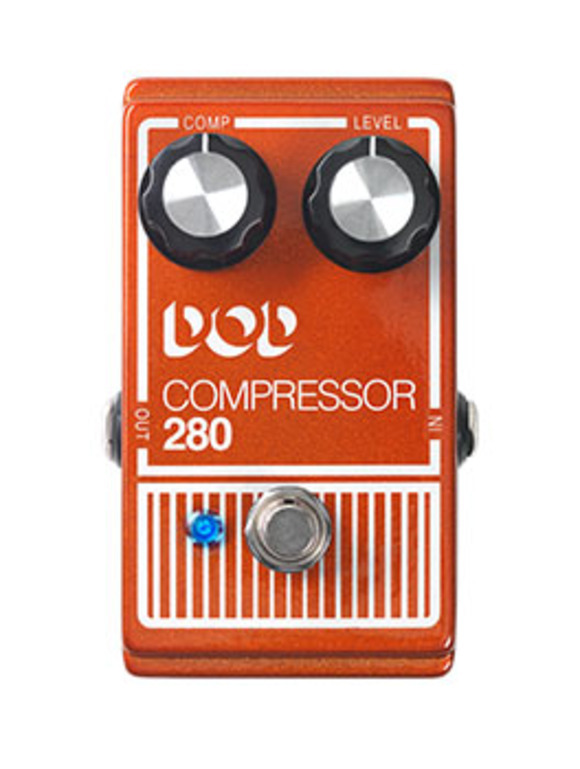 The Compressor 280’s true bypass operation keeps the tone of the instrument pristine when the effect is not in use. Its 9-volt DC power supply input makes the Compressor 280 far more pedalboard-friendly than the original and its bright blue LED indicator is easy to see on any stage. The pedal’s retro-classic look is evocative of its 1970s origins, while its road-tough enclosure ensures it’ll be around for years to come.